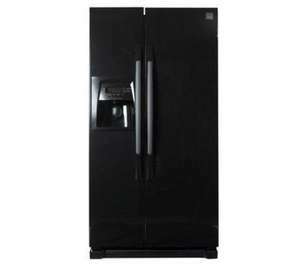 The Daewoo FRSU20DCB American Style Fridge Freezer looks fantastic in any contemporary setting with its smooth black finish. And if you want to make sure you're doing your bit for the environment, the Daewoo FRSU20DCB is ‘A' rated for energy efficiency, and will also save you money on the electricity bills. With an impressive 531 litre capacity, the FRSU20DCB American Style Fridge Freezer will cater for even the largest of family occasions, so you won't need to worry about running out of space. With external controls, the FRSU20DCB American Style Fridge Freezer will cater to your own specific needs, and is also extremely easy to clean, featuring 3 adjustable safety glass shelves which will ensure that even larger products fit in your fridge-freezer. Complete with fast-freeze, your food will be kept as fresh and nutritious as possible, and as it's frost-free, you'll never need to worry about clearing out a troublesome build up. Handy features such as 5 door shelves, 2 salad crispers, and a chilled drinks/water dispenser mean the FRSU20DCB American Style Fridge Freezer couldn't get much more impressive than this! Voted hot these things are usually £600+ for a cheap model anything up to 1000's for top of the range ones. Daewoo stuff is great. I've had one of their industrial microwaves/grills for about 11 years now, and it's in perfect condition! It would appear that their appliances are far better than their cars. Be aware though that A rated for energy isn't actually very good given that the scale confusingly goes up to A+++ (in fact A seems to be the lowest rating on sale in most shops).